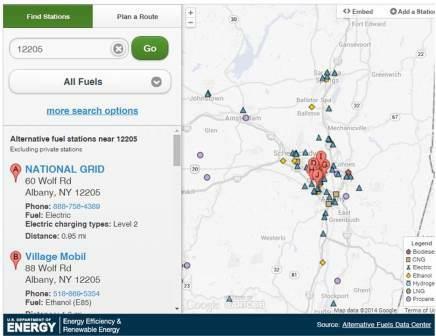 Question of the Month: What fuel-specific information is available through the Alternative Fuels Data Center’s (AFDC) Station Locator website? Answer: Most Clean Cities coordinators and stakeholders are familiar with the AFDC Station Locator website (http://www.afdc.energy.gov/locator/stations/) and the general station information listed there, such as the address, phone number, hours of operation, payments accepted, and who can access the station. The station locator is also embedded on the Clean Communities website. You may not be aware of the fuel-specific information available. Below is a complete list. Blends available: The blends of biodiesel available at the station, including whether different blends are available seasonally and whether customers may select customized blends. Note that the Station Locator only lists stations that carry blends of B20 (20% biodiesel, 80% petroleum diesel) and higher. Mid-level blends: Whether or not the station carries mid-level blends (e.g., 30% ethanol blend, or E30) of ethanol via a blender pump or otherwise. Note that stations that carry mid-level blends, but not E85, are not included in the Station Locator. Electric charging network: The relevant charging network, if applicable. Examples of charging networks include ChargePoint, Blink, and SemaConnect. Port level and count: A list of the number of each level of EVSE charging equipment available. Levels include Level 1, Level 2, or DC Fast Charge. Legacy chargers: The number and type of legacy chargers available. The National Renewable Energy Laboratory (NREL) also collects information on the EVSE manufacturer, power sources, pricing, and whether the equipment provides wireless charging. This data will be available in the Station Locator in the future. NREL is also coordinating with EVSE networks to provide real-time status availability in the Station Locator. Station status: A website link for detailed information regarding the status of the station. Fill type (CNG only): Whether the station has fast- or time-fill capabilities, or both. Compression (CNG only): The compression pressure in pounds per square inch (psi). The compression can be 2400, 3000, or 3600 psi. Vehicle accessibility: The vehicle sizes that can physically access the fueling station. NREL also collects information on the total compression and compressor types (CNG only), gas provider, and whether the station has a generator to operate equipment during a power outage. Some of this data will be available in the Station Locator in the future. Services: The type of propane services available. Each propane station is designated as a “primary” or “secondary” service type. Both types are able to fuel vehicles, but locations with a “primary” designation offer fuel priced specifically for use in vehicles. Using the AFDC Station Locator Data Download feature (http://www.afdc.energy.gov/data_download/), users can obtain a detailed spreadsheet with the above fuel-specific station information for stations currently in the database. We encourage you to stay tuned as NREL is working to add new fuel-specific data and search options to the Station Locator database in the near future.